dalla Rosa is delighted to present Cross - Reference an exhibition of recent work by Veronica Bailey and Aliki Braine. Although the two artists have not met before discussing this project, their approaches to the traditional genres of portraiture and landscape show a strong afﬁnity. 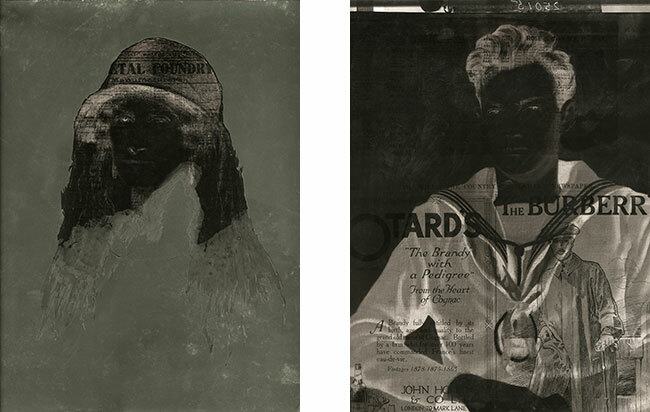 Firstly the direct use of photographic negatives, which both artists manipulate and re-photograph, but also the reference to a wider historical context, which translates in Braine’s allusion to 19th century landscape painters (especially Jean-Baptiste-Camille Corot), and Bailey's interest in photographic documentation of 20‘h century British high-society portraits. Interestingly, Braine used the portrait traditional format for some of her landscapes and Bailey composed her portraits in landscape view, a cross-over that strengthens the dialogue between their practices. Aliki Braine‘s work explores the physical nature of photographic images and the debt photography owes to the history of Western European painting. Often folding, drawing with ink, punching holes or overlaying her negatives with adhesive labels, Braine violates the pristine surface forcing the viewer to acknowledge the photograph as an object and the image as a construct. The works from the series Folded consider and point to the compositional decisions made when taking photographs. Many of these images take as their source the landscapes painted by Corot, in which he repeatedly placed a leaning tree to create a diagonal tilt within the compositions. Braine has folded her negatives along the major lines that bisect the composition before printing them, resulting in an image folded over itself. At the 2015 Photo London Fair, Veronica Bailey attended a tour of the Witt and Conway Libraries at The Courtauld institute of Art. A selection of uncatalogued boxes belonging to the de Laszlo gift of Paul Laib negatives became the subject of a further 12 months research, leading to a photographic project within the library. Bailey discovered that several of the cardboard Kodak boxes contained pages torn from a trade directory inserted between the plates, suggesting a new 'sandwiched narrative' of both artistic and photographic signiﬁcance. The Glass Ladies series introduces titles such as Lady Prichard, Lady Reilly and Lady Shutter, forming new identities for the sitters. These women are unwittingly remodelled as advertising mannequins for a variety of proletariat trades, alongside companies such as Sidroy Lingerie, Deans Blinds, Glasso Paints, Pritchards Bride Cakes, and Quickset Water Sealers. The presentation of these new images as near colourless diptychs (both positive and negative) suggest the push and pull of possible public and private relationships, hinting at a segregation of class.